In the profound realm of the space and expanse of the dharmakaya, the wealth of enjoyment of the five certainties of the Buddha’s spontaneous accomplishment is perfected. The dance of the manifestation of various magical displays is performed. With great reverence I prostrate with my three doors to the all-pervading lord, the primordial protector, to the Conquerers, their sons, the Aryas, and to all of the Tibetan scholar-adepts, those who came, those who appear now, those who remain, and who are the protectors of sentient beings and the teachings. Having expressed this worship, I will speak just a little of what has occurred from long ago until now here at this nunnery called Karma Zurmang Jadral Thubten Shedrup Chokyi Gathsal. First, I will express the greatness of this location. Within the six sections of the southern continent of the world in the center of this three thousand-fold universe which is endowed with a Conqueror, there is the cool region encircled by white. Within this is the high land of Eastern Tibet with four rivers and six hills, where the excellences and ten virtues of a region are complete. This supreme place for the accomplishment of merit is the palace of Sri Chakrasamvara, the glorious auspicious Zurmang, the right corner of the teaching center, the land of the spontaneous accomplishment of theory and practice, the silver throne of the heavenly upasaka, like the innermost tent of white silk, which is closely guarded in its front, lower part. In the east there is the sacred place of the lotus which liberates upon seeing. In the south there are 100,000 fortresses, the mountain hermitages of the Conqueror. In the west there are the twenty-five sacred places of Tibet. The north is completely surrounded by the major and minor sacred sites, such as the white snow mountains. Furthermore, all of the cardinal and intermediate directions are thoroughly filled with such things as mountains, rocks, and lakes that naturally possess positive protective forces of powerful gods, nagas, and spirits. 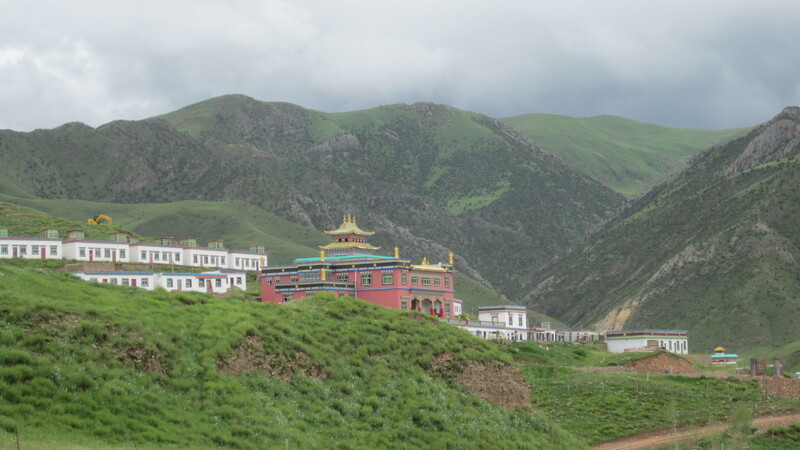 The four pillars of the land of the north, east, south, and west are complete, and the measure of the land is perfectly in accordance with the scriptural tradition of the Kangyur and Tengyur. In particular, this land is excellently in accordance with the great scholar Pema Namgyal’s three-part treasury on miraculous geomancy. The heavens above are a wheel of eight beautiful spokes pitched like a parasol. The shape of the earth below is like four seats stacked amidst an eight-petalled lotus. The cardinal and intermediate directions are as if filled with various precious substances such as the eight auspicious symbols and the seven precious royal treasures of a universal monarch. In front there is a gold-painted mountain like a mandala heaped with gold. The right is vast in the style of an arrow boundary arisen from directionless wisdom. In the middle are a naturally arisen sun and moon and a channel of one hundred springs, beautiful like a constellation. The left direction is as if painted like a spread religious robe. The red hill behind is like an indestructible iron mountain. The three upper, lower, and middle parts are conjoined like a turquoise dragon crossing a river. If one beholds this land, which is covered with barley and minerals and is rich with livestock, one’s mind becomes joyful. If one lives on this land, it is sublime. In particular, living beings make efforts in dharma activities in that beautiful sunny valley, and their oral tradition is renowned as the “dharma throne.” As for the “sunny valley,” at the four times of summer, winter, autumn, and spring, the shining of the sun is said to be vast and open, and the traversing of the sun and moon is said to be extensive. As for the “dharma throne,” in that land there is a high throne which is made from a stack of vajras. Now, at the time of the arrival of the Conquerors, fathers and sons, the outer and inner lamas and tulkus, to the land of Zurmang, the place of spontaneous accomplishment, having first sat on the throne, khatas are offered by the laity and ordained townspeople, empowerment is conferred, and an explanation of the dharma is given. A ceremonial elaborate feast is spread, and there is the traditional custom of coming and greeting inside the nunnery and a reception with a procession of lamas. At the time of the second incarnation of Ten Tulku, Tenzin Legshe Drayang, here at Zurmang the great dharma college grew and flourished. Many disciples from the lands of China, Tibet, Mongolia, Bhutan, Nepal, and Sikkim gathered. In accordance with the oral tradition, at the time of that renowned one the wheel of the dharma was turned, remained, and so forth. Based on that, the name “dharma throne” was designated. Also, at this place, the major and minor marks of the Fifth Zurmang Gharwang, Karma Chokyi Namgyal, blossomed. Chokyi Namgyal’s emanations were guarded day and night by the renowned raven, and in reliance on that, from then until the present the Gharwang incarnations have progressively come. Since the greatness of this site has been generally expressed, I will now discuss how those people who are holders of the teachings received from the founder carried out the teachings. One of the eighty Indian mahasiddhas, the glorious Tilopa himself, having accomplished the secret of the dakini from the western land of Uddiyana, spread the jewel trilogy of the oral lineage in the land of worldly people with a multitude of symbolic means. Subsequently the teachings were cultivated to their completion. For the purpose of subduing suitable disciples, he willingly took birth in the form of a person of the world in cyclic existence. The principle heart-son of the Tathagata, the unsurpassed guide of the three worlds, the glorious king of the Conquerors, the Fifth Karmapa, was the great lord of siddhas Trungmase Lodro Rinchen who himself established the part of the Karma Kamtsang practice lineage known as the Karma Zurmang Kagyu teachings. In his 38th year, the great Siddha proclaimed the great monastic seat, the glorious auspicious Zurmang dharma land of the spontaneous accomplishment of theory and practice. Translated from a hand written Tibetan manuscript. Please note this is a first draft and not for citation. Back to the Zurmang Nunnery Page.